Perhaps one of the biggest draws of wine country (other than all the fabulous wine) is the stunning scenery. From gentle rolling hills and vineyard vistas, wine country is a breathtaking pastoral escape from urban life. Napa Valley Bike Tours provides everything you need to enjoy the fresh air as you leisurely pedal through a picture-perfect landscape. 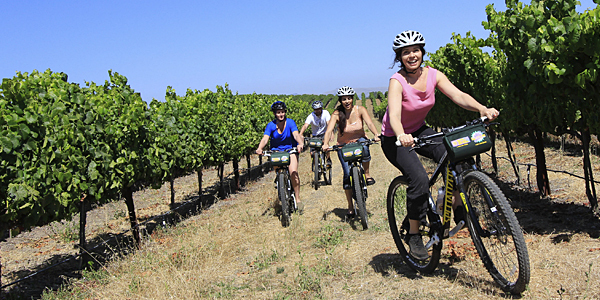 They offer several different experiences to bike through wine country and each tour is unique. Create unforgettable memories that are truly different than everyone else’s trip to wine country. Firstly, you can take the path of least resistance and simply rent a bike from Napa Valley Bike Tours. They have two shop locations: Downtown Napa (950 Pearl Street) and Yountville (6500 Washington Street) that are 9 miles apart. You could start in Downtown Napa and ride up the Vine Trail bike path, visiting wineries such as Trefethen, Laird, Silenus or Domaine Chandon. Ride north to Yountville, where you can grab a refreshing drink or bite to eat at one of the many amazing restaurants. If you prefer, you can then return your bikes to the Yountville store and catch a ride to your next destination. Or you can choose the perfected Self Guided Bike Tour package. Starting and finishing in Yountville, Napa Valley Bike Tours will happily pick up your wine purchases for you and deliver a delicious box lunch to a winery with a picnic area or to a local park along your route. Please note that a wine tasting appointment is required when you will be picnicking onsite at a winery. This way you still have the flexibility to create your own itinerary and have added support and convenience! If you’d rather join a tour led by a knowledgeable local guide, the Cycling in the Vineyards tour is hard to beat. This tour focuses on the Carneros region which is in southern Napa Valley and is famous for producing some of the very best Chardonnay and Pinot Noir. Gentle rolling hills provide not just beautiful scenery but also an easy ride -- so no need to worry that the exercise might be too extreme. With a casual biking pace and frequent stops, the emphasis is to immerse yourself in your surroundings and learn about the vineyard growth cycle. You’ll pedal an average of two to four miles between stops; the total amount of riding on this tour is less than 10 miles. The riding is mostly flat and a mix of about 70% on quiet country roads and 30% off-road riding through the vineyards. You’ll visit two wineries, taste delicious wines, and get a little exercise and lots of fresh country air as well! Not much of a cyclist? Don’t feel like pedaling around town? That’s ok, you can still get outdoors and go wine tasting. Join the Pedego Electric Bike tour and ride for miles without breaking a sweat! This tour takes you to two wineries but you’re welcome to keep your eBikes to explore on your own for the rest of the day. This tour also includes $25 “Oxbucks” per person to spend at your choice of delicious vendors at Oxbow Public Market, just a half-mile from their downtown shop. You’ll have lots of options to choose from like wood-fired pizzas, oysters from the famous Hog Island Oyster Co., burgers & milkshakes, fresh Mexican food, local beer and wine, artisan ice cream and much more. Grab a seat at a picnic table on Oxbow’s back patio overlooking the Napa River and enjoy a relaxed lunch. See you soon!